EXTRACTOR II is a Force test system designed for the cork manufacturing industries. It allows to measure cork extraction strength in order to optimize the cork products and assembly/sealing process. The manual cork testing has been developed in collaboration with the area of Bordeaux. EXTRACTOR II is a simple and convenient manual force tester, that ensures a repeatedly and accurate measure to identify the pull-out force required to extract the cork from still wine bottles. The company needs to identify cork extraction strength to optimize its cork products to enable easier opening by consumers, yet retain a good quality seal to avoid wine taint and minimize exploding corks. Operating principle: The system operates by applying a linear tensile action to the cork, held within a dedicated corkscrew, to release the cork from the bottle, while the bottle is simultaneously hold firmly. The maximum pull out force displays on the force gauge. 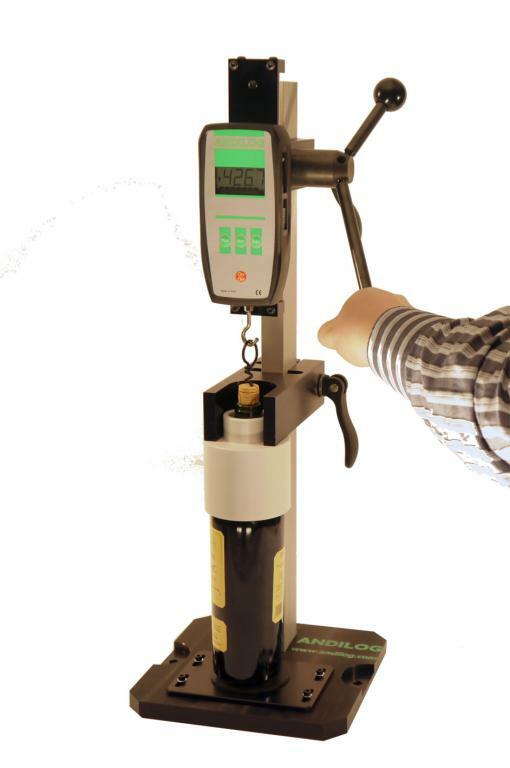 A robust tester and consistent reproducible measurements Extractor II is designed with two quick releases handles for an easy height adjustment, whichever the type of bottle your need to test (75cl, 50cl,..). The small handle allows the height adjustment, when the large handle is used to apply the tensile force. 1. Both the bottle and the cork remain in the same axis as the force gauge, in order to limit errors due to non-axial force. 2. Protect the bottle and avoid direct contact with the tester. It has an interior convex shape and can be mounted on bottle up with a diameter up to 76mm and a neck diameter up to 38mm. A damping washer equipped the tester. A flexible elastomeric washer damper is mounted on the tester, which provide protection and reduce the impact of the bottle after the cork extraction to the unit.